Had this video sent to me recently and I’ve found myself watching it a few times. While not totally my style, it’s interesting to watch. The video is courtesy of J.P. Moses at REI Tips (Real Estate Investing Tips) in Memphis, Tennessee. They offer a variety of free real estate forms for landlords in the United States at Free REI Forms. It’s a landlord declaration of sorts – a very clear one. 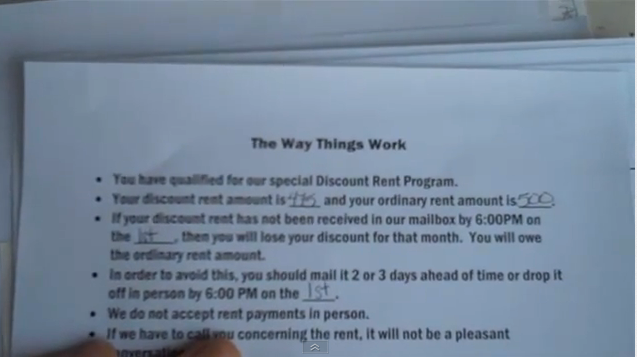 He offers a discount rent program if the rent is paid on time as an incentive, while also indicating that there is a 10% penalty in the event that rent is not received by 6 p.m. on the first of the month. The Way Things Work also goes on to clarify other rules and expectations – specifically the emphasis on communication as an essential component of a positive relationship between landlord and tenant. Again, while not totally my style – it’s interesting, and there’s nothing preventing a Canadian landlord from adopting something like this as an addendum to any written lease. Check it out and share. What do you think of this approach?